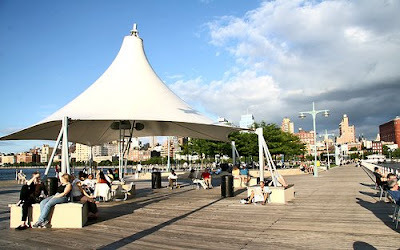 On my way back from lunch at the Christopher Street pier, I decided to pop up into St Luke's Thrift Shop on Hudson St (South of Christopher) when I saw the sign out front announcing "dresses on sale, 50% off." 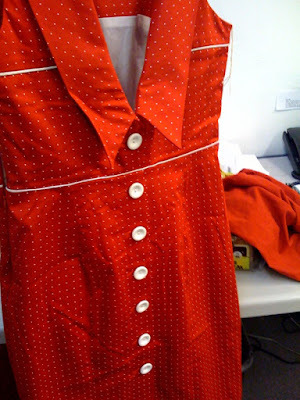 I walked through the door and the first thing I saw was this adorable early 60s style red dress with white polka dots. I took a look at the back and that's what got me. "Try it on," said the lady working there. "It's so cute, and look, it's new." The tags were still on it. 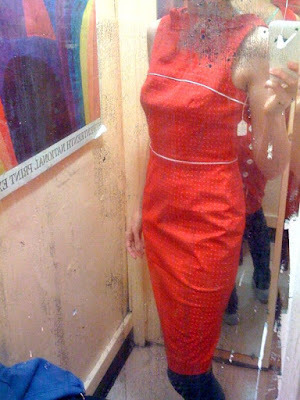 Such is the way of ladies of means - buying dresses, never wearing them, then donating them to a thrift shop. I can't say I'm not completely innocent of this. At least one pair of shoes in my closet have met the sidewalk only once or twice. I tried it on and it fit perfectly. The tag said $40, but I got it for $20. Thrifty is nifty. Now at Greenloop, get 50 to 75% off ethically and ecologically minded clothing line Edun - the brainchild of Ali Hewson and Bono (with some help from New York clothing designer Rogan Gregory). Get 'em @ Greenloop while the gettin' is good.